Togakushi Shinobi Apparel: Hakama is a Leg Guards in Nioh. 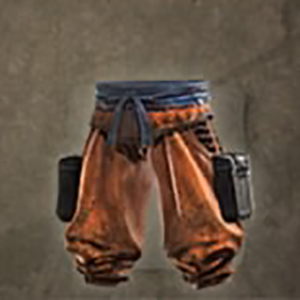 "Lower-body wear made of cloth and dyed a deep khaki. The dye used contains tannin, which acts as a natural disinfectant and can help stem bleeding in emergency situations. This apparel was worn by the Togakushi ninja, whose base was located at Mount Tokagushi in northern Shinano province (present-day Nagano prefecture). Sarutobi Sasuke, who travelled the lands in order to master the ninja arts, trained rigorously on the precipitous crags of Togakushi in order to hone his skills"